Throughout history, land, houses and buildings have been used to safeguard wealth. But despite the utility of property as a store of value, the buying, selling, and trading of real estate has remained a lengthy and complicated process. Today, however, the Blockchain renders these past issues obsolete, and even paves the way for an entirely new opportunity: property as a medium of exchange. For the first time, premier real estate havens like London, New York, Paris, and Los Angeles, once only accessible to the global elite, are open to all types of investors via the TPX exchange. Crypto Residential Property: a $20 Trillion Market. Property Certificates can be purchased or sold from £250 to £25,000,000 ($350 to $35,000,000 USD). Traditionally, property has been sold in its entirety. Now with TPX, you can buy or sell as much or as little as you'd like and in the crypto currency of your choice (e.g. Bitcoin). This provides investors the means to lock in their crypto currency gains at any time. As with all crypto currency transactions, the time to convert into a legacy currency is not reliable or even sure, with the process taking anywhere from a few seconds to several weeks. Now with TPX, you can immediately purchase your selected property with the assurance of an immediate crypto currency price and instantaneous transaction. Property certificates are recorded and registered on the Blockchain, providing definitive legal and financial ownership and, more importantly, public transparency for the property owner. These "Pocket Deeds", registered via the Blockchain Land Registry, carry the full force of legal ownership and can be sold, bought or exchanged as easily as any other crypto currency. Typically wth traditional property purchased, transaction costs range from 5 to 15 percent of the property. Cryptonised property certifcates bring transactions costs down to 1 percent per transfer of property. These low costs make for a robust property exchange. Buying and Selling Properties Globally with Bitcoin. An important element to ensure the tradability of any property asset is its physical and financial integrity. The property must be free of any current and future financial encumbrances. Additionally, hazard insurance must be continually in place to protect the assets' value. TPX guarantees that the property certificate is fit and ready for trading. The trading of orders and listing of property certificates make instantaneous transactions possible. 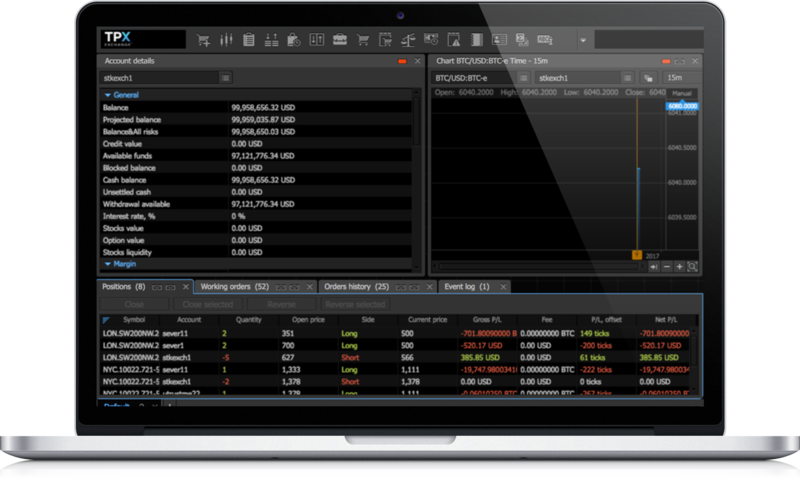 Sell and buy orders are matched and the transactions are completed on a real-time basis. The environment for trading is continuously scrutinised by TPX to ensure real-time fulfillment without disruption. Without question, the most important aspect of the TPX exchange is security. Every aspect, from order placement to fulfillment and settlement is tightly controlled. A significant amount of TPX operational resources is devoted to maintaining customer security and the integrity of the trading environment. With blockchain technology... - An extremely fast means of converting fiat or crypto (e.g. Bitcoin) to property. - The ability to micro-invest or purchase hundreds of millions of pounds in prime real estate, essentially democratising the market so that investors of all means can participate. - A stable crypto asset, backed in a fail-proof manner by real property, thus creating the perfect safe haven for securing your wealth—whether crypto or fiat-generated. With cryptonised real estate, property owners can now open up a global marketplace. Traditionally, a seller's property was marketed to local potential buyers. Now, the seller's property is marketed to buyers in all corners of the globe. Investors can immediately purchase a seller's property certificates with an instantaneous transaction and definitive payment method in the form of crypto currency. The Market advantages for real estate are expanded in a Blockchain-enabled environment. Traditionally, sellers have been limited to the local geographical area of their properties in order to attract buyers. Buyers, likewise were limited to the geographical area of the sellers. With these two contraints removed, both parties can vastly increase the desirability and exposure of the property being sold or bought.